1) Can block 99.99% of the UV, greatly reduce the damage to the human body by UV. 2) You can bend, Easy to block ultraviolet rays from multiple directions to your injury. 3) Easy installation, easy disassembly, light weight, small size and easy to carryIt, greatly saves you time to enjoy the outdoor life. 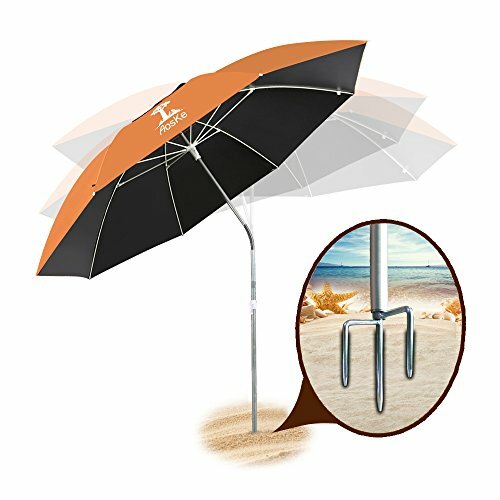 4) Umbrella is the inner layer of vinyl material, anti-ultraviolet, heat and anti-oxidation effect, to extend the life of the umbrella, so you can use long-term, bring you a beautiful experience..
Beach, patio, swimming pool,golf course, soccer field, fishing and other outdoor places.Travel, outdoor camping, car essential. One Year Manufacturer's Warranty. Or you can directly contact us, when you meet with quality problems. ★ Outdoor umbrella stand table Tilt-feature to block the sun's UV rays from any angle.Vinyl materials can block heat, so you do not feel the slightest heat in the hot sun. ★ Pointed prong anchor into the ground by stepping on integral stand,Perfect for grass and dirt fields,sand ground. ★ EASY OPERATION WITH STURDY STRUCTURE - Light weight aluminum poles unscrew at middle for easy and compact storage, in prevention of rust and lighter than the steel center pole umbrella. ★ BEAUTIFUL COLOR & 100% POLYESTER- Made of breathable, light filtering fabric that can block up to 99.9% of harmful UV rays and not easy to fade. ★ Top air vent with durable top finial for better cooling and against with buffering wind impact.In the hot summer season still give you a cooling feel. If you have any questions about this product by AosKe, contact us by completing and submitting the form below. If you are looking for a specif part number, please include it with your message.